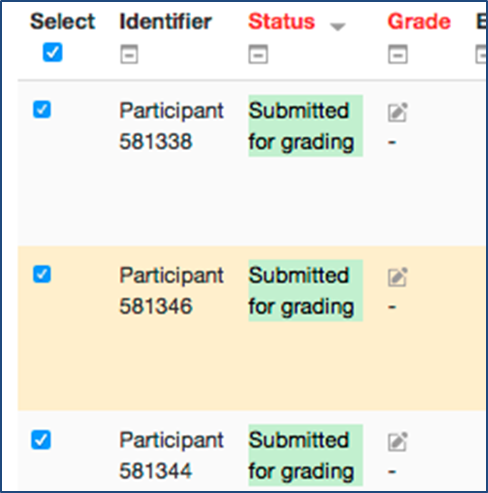 Once activated in the assignment creation process (see Create an assignment for individual student submissions), this option enables the marker to control when grades and feedback are released to students on a cohort or individual basis. It also provides a way to keep course organisers and students informed of the exact status of the marking process. It can be used with or without blind marking and with or without marking allocation. When you set up your assignment make sure that you set ‘Use marking workflow’ to Yes in the edit settings of the assignment under the section ‘Grade’. Click the Assignment and View/grade all assignments. Scroll to the bottom of the page and under Options / Assignments per page select All to get all assignments to display on one page. Select the submissions for which you want to use marking workflow using the Select box to left of each submission – to select all submissions, click the Select all box under Select. Scroll to the bottom of the page and from the drop-down menu With selected… select Set marking workflow state and Go. In review – the marking is now with the person in charge for quality checking, this is useful for first markers to flag work for moderation. To change the state as you proceed, you can repeat the process above on an individual or bulk basis and select a different state e.g. Marking completed or Ready for release. You do not need to use all of them. When you are ready to release marks to students, repeat the process above and select Released. At this stage (and earlier stages) you can choose to Notify students by selecting Yes to generate an email. Students will then be able to review their grades and feedback. N.B. 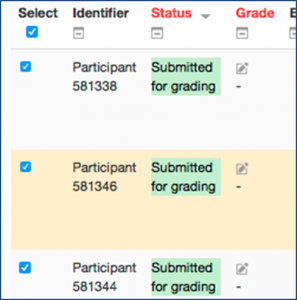 If blind marking is in use with marking workflow, the grades are released regardless of whether student identities have been revealed. However, you and other markers are likely to want to reveal identities at some point. If you cannot find the option Reveal student identities in the Grading action drop-down menu at the top of the submissions table, you will need to ask someone with Teacher (Editor) or higher access to do it.